Everyone hates car trouble. There’s that moment of dread when a red light comes on or a needle moves from the green side to the red side of the dial on the dashboard. Those indicators are there to let us know something has gone wrong. The car is not operating like it should, and it needs to be fixed. However, the first step in the repair is not to tear into the dashboard and start replacing the indicators; the dials and lights – at least it shouldn’t be. While indicators do need to be replaced from time to time, they are there to point us to where the real trouble is: the oil pressure is low, the temperature is high or the timing is off. Now I’m not writing to talk about car care; but rather to make a comparison to how we respond to indicators in our spiritual life. If we don’t tear into the dashboard when something has gone wrong with our cars, then why would we take that kind of approach with something more precious than our vehicles – our spiritual lives? You see, our behavior as Christians, is only an indicator of our spiritual condition. It’s not the engine. So when we sense greed starting to grip our hearts and we seek to address it by developing a plan to be generous to the less fortunate, or we try to fix our inability to withstand temptation by getting an accountability partner, we are working on indicators? It’s not that practical plans and accountability are bad in themselves, they are just bad by themselves. 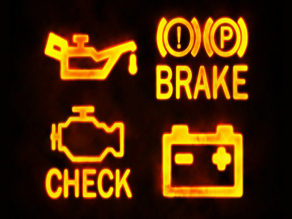 Addressing behavior without addressing the real heart issues is like trying to fix the dashboard light when the real problem is in the engine. OK. So what is the engine? I’ll explain. Jesus was asked the question, “What are the works of God.” His answer was an interesting one. He said that believing in Him is what it means to do the works of God (Jn 6:29). The Apostle Paul, when explaining the spiritual growth in the Christian Church, said that it was the gospel that was bearing fruit (Col 1:5-6). What both Paul and Jesus were getting at is that the heart is the engine of the spiritual life and the only way to fix it is by changing what we believe; namely believing the gospel – and that goes for Christians too. The gospel is more than the push that gets the Christian life started, it’s the fuel that keeps us moving. It’s on-going belief in Christ’s work as Savior that melts our hearts and causes us to serve Him as Lord. It’s understanding that Jesus did for us what we could never do for ourselves that motivates me to obey. It’s knowing that He paid for my sin and gave me His perfect righteousness that makes me want to live up to that righteousness. And it’s also realizing that He does all of that as an act of pure grace to those who don’t deserve it, and wouldn’t even ask for it apart from the Holy Spirit drawing us. That truth may not be clearer anywhere than in the Pauline Epistles (Paul’s letters: Romans – Philemon). In Ephesians and Colossians especially, Paul begins with the richness of the gospel, all that God has done for sinners by grace. He then moves into the implications of the gospel: what a life that has been gripped by the truth of the gospel should look like; including our behavior and attitudes. However, something happens to us when we begin to measure our lives against those standards and realize that we aren’t measuring up. We typically begin working on stomping out our sins and overcoming our shortcomings. We begin working to modify our behavior; trying to fix the indicators. Here’s what I mean. If we are not the husbands that Ephesians 5 says we should be or the servants that Colossians 3 details, then what we typically do is begin to craft a plan to do better and try harder to be those things. We focus on correcting our disobedient behavior, all the while, ignoring the gospel unbelief that is driving our wayward ways. That is working on the dashboard indicator instead of the engine. It might keep the light from blinking (stopping the behavior) but it will not make the car run properly (a changed heart). This is a huge temptation for us, because of our performance-based culture. When the indicators of our lives are blinking (like not walking in obedience to the Bible’s commands) we set out to fix them by fixing our behavior. We deploy a performance improvement plan and/or better self-discipline. We put all our effort into living out Ephesians 5 when Ephesians 1 – 3 has not gripped our hearts. That is working on the indicators. That will not fix the engine. That will not change a heart. If we want a changed heart (to fix our engines) we must go back to the beginning of those letters, back to the gospel, and determine why grace has not captivated us to the point of obedience. Why isn’t Christ’s love enough for me to love others? Why isn’t the cross compelling enough for me to turn from my sin? Why isn’t perfect righteousness given to me freely, enough to make my heart sing with unwavering contentment and joy? The reason is always unbelief in the gospel, and it usually shows up in my life as idolatry; me looking to something other that Jesus as my functional Savior.That means I have been looking to other things, less that Jesus, for satisfaction. Something has become an idol and has captured my heart, leading me away from peace and joy in Jesus alone. That is my engine trouble, and only casting down that idol and renewing my belief in the real gospel will set my heart back into alignment with who I am in Christ (an engine hitting on all cylinders) – and my behavior (indicators) will follow. So the next time a light flashes on your dashboard, don’t bang on the steering wheel – check under the hood.